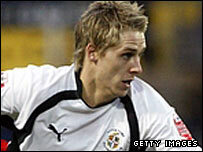 Wolves have completed the signing of midfielder David Edwards from Luton. The 21-year-old has moved for an undisclosed fee, believed to be around £675,000, and has agreed a deal at Molineux until 2010. Edwards trained with his new team-mates at Wolves' Compton Park complex on Monday and is set for his debut at Scunthorpe on Saturday. He is the second signing at Wolves in the space of a few days following the £1.5m arrival of Sylvain Ebanks-Blake. It was announced last Thursday that Edwards would be one of five players leaving cash-strapped Luton, who are in administration. The following day, manager Kevin Blackwell and his two assistants announced they were resigning and would leave the club in a month's time after the administrator authorised the player sales without consulting them.